Finally, some empirical evidence that illustrates what we've known for some time now: Android is growing like gangbusters. In fact, 28% of smartphones sold in Q1 2010 were Android, compared to 21% for iOS. RIM still holds the top spot with 36%, but that's a drop of roughly 12% in the past year - while iOS has fallen approximately 10% itself. 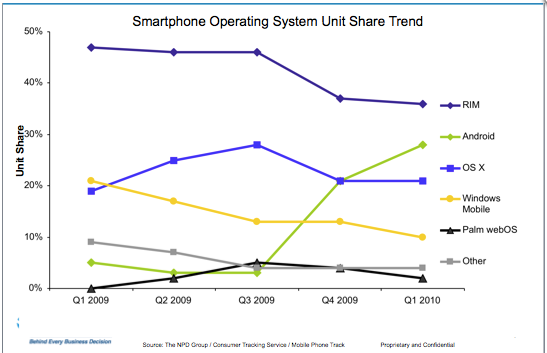 In the same period, Android increased over 20%. In fact, it seems like Android grew at the expense of just about everyone else - excluding a minor 1-2% increase in "other". And as Android continues to expand across the line of devices - from smartphones to ultra-cheap featurephones - it's likely that the overall number of Android devices will continue to grow. NPD's numbers are from self-reported surveys. They are based on a sample, and only factor in consumer purchases - not enterprise.